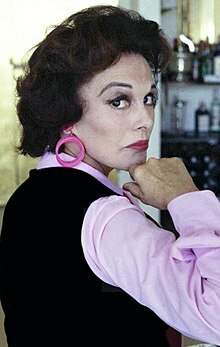 Patricia Paz Maria Medina (19 July 1919 – 28 April 2012) was an English actress. Medina was the daughter of Ramón Medina Nebot, a Spanish lawyer and opera singer from the Canary Islands, and her mother was English. Patricia had two sisters, Piti (Pepita) and Gloria. Born in Liverpool, she and her sisters grew at a mansion in Stanmore. Medina began acting as a teenager in the late 1930s. She worked her way up to leading roles in the mid-1940s and left London for Hollywood. In 1950's Fortunes of Captain Blood, she teamed with British actor, Louis Hayward. She and Hayward subsequently appeared together in 1951's The Lady and the Bandit, Lady in the Iron Mask and Captain Pirate from 1952. Darkly beautiful, Medina was often typecast in period melodramas such as The Black Knight. Two of her more notable films were William Witney's Stranger at My Door and Orson Welles' Mr. Arkadin, based on episodes of the radio series The Adventures of Harry Lime, itself derived from The Third Man film. Although prolific during the early 1950s, her film career faded away by the end of the decade. In 1958, she performed in four episodes as Margarita Cortazar on Walt Disney's ABC series, Zorro. In 1958, she also appeared as "The Lady" Diana Coulter in Richard Boone's CBS western series, Have Gun, Will Travel. She was then cast in an episode of Darren McGavin's NBC western series, Riverboat. In 1960, she was cast as different characters in two episodes ("Fair Game" and "The Earl of Durango") of the ABC western series, The Rebel. Medina also made television appearances on Perry Mason ("The Case of the Lucky Loser", 27 September 1958); Bonanza ("The Spanish Grant", 6 February 1960), Thriller ("The Premature Burial", 1961), The Alfred Hitchcock Hour ("See the Monkey Dance", 9 November 1964) and The Man from U.N.C.L.E ("The Foxes and Hounds Affair", 8 October 1965). Medina guest starred as Ruthanne Harper in "Incident of the Boomerang" in 1961 and Ilona Calvin in "Incident at Jacob's Well" in 1959, on Rawhide. also appeared in The Amos burke (Gene Barry) TV episode Don Pablo 1967. In 1968, she returned to the big screen in The Killing of Sister George, Robert Aldrich's adaptation of the lesbian-themed drama of the same name. Medina and her husband, American actor Joseph Cotten, toured together in several plays and on Broadway in the murder mystery Calculated Risk. In 1998, she published an autobiography, Laid Back in Hollywood. Medina married British actor Richard Greene, 24 December 1941, in St. James's Church, Spanish Place, London; they divorced in 1951. Medina married Joseph Cotten on 20 October 1960, in Beverly Hills at the home of David O. Selznick and Jennifer Jones. No children were born from either marriage. Medina died at age 92 on 28 April 2012, from natural causes at the Barlow Respiratory Hospital in Los Angeles, California. Her remains are buried at Blandford Cemetery in Petersburg, Virginia, beside Joseph Cotten. ^ "Index entry". FreeBMD. ONS. Retrieved 3 May 2012. ^ "Actress Patricia Medina dies at 92 – Entertainment News, Film News, Media". Variety. Retrieved 1 May 2012. ^ a b Medina Cotton, Patricia (1998). Laid Back In Hollywood. Bell Publishing. ISBN 9780964963511. This page is based on the Wikipedia article Patricia Medina; it is used under the Creative Commons Attribution-ShareAlike 3.0 Unported License (CC-BY-SA). You may redistribute it, verbatim or modified, providing that you comply with the terms of the CC-BY-SA.